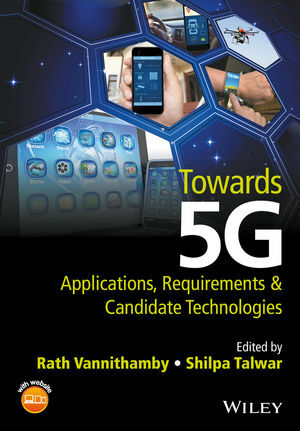 This book brings together a group of visionaries and technical experts from academia to industry to discuss the applications and technologies that will comprise the next set of cellular advancements (5G). In particular, the authors explore usages for future 5G communications, key metrics for these usages with their target requirements, and network architectures and enabling technologies to meet 5G requirements. The objective is to provide a comprehensive guide on the emerging trends in mobile applications, and the challenges of supporting such applications with 4G technologies. Rath Vannithamby received his PhD degree in EE from the University of Toronto. He leads and manages a team responsible for 4G/5G cellular research in Intel Labs. Prior to joining Intel, he was a researcher at Ericsson responsible for 3G research. Dr. Vannithamby is a Senior Member of IEEE. He has published over 50 scientific articles and has over 120 patents granted/pending. His research interests are in the area of 4G/5G broadband mobile networks, energy efficiency, QoS for mobile internet applications, cross-layer techniques, cognitive radio, and machine-to-machine communications. Shilpa Talwar leads a small research team focused on advanced network topologies for improving the capacity and service quality of cellular networks. Her research interests include heterogeneous networks, multi-radio interworking, device to device communications, and advanced MIMO and interference mitigation techniques. While at Intel, she has contributed to IEEE and 3GPP standard bodies, including an IEEE wide tutorial on Future Wireless Networks with support of many industry partners, which led to formation of multiple study groups in IEEE 802.16, and the 802.16p standard. She is currently coordinating an effort on 5G technologies with several leading universities and industry partners. Shilpa graduated from Stanford University in 1996 with a Ph.D. in Applied mathematics and an M.S. in electrical engineering. She is the author of 60+ technical publications and patents.